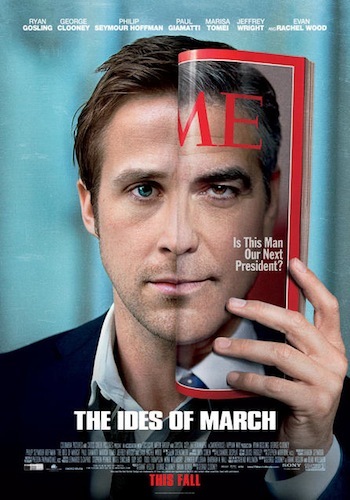 George Clooney’s THE IDES OF MARCH screened at KCET’s Fall Series on Tuesday, October 4th, 2011. As always it was at the American Cinematheque’s lovely Aero Theatre, and I have to say, I loved it! Maybe I’m biased, but I’m a sucker for Clooney. I have enjoyed all of the films he has starred in and/or directed. Especially CONFESSIONS OF A DANGEROUS MIND and GOOD NIGHT, AND GOOD LUCK. Yes, I even enjoyed LEATHERHEADS, though most people didn’t. It’s probably a movie most people don’t want to see, a throwback to old screwball comedies. Well, I was the demographic and I grew up on those comedies. Anyway, his new effort is another great inside look into the world of politics. If you wanted to look at the story and break it down, I could see people being upset; there are moments of predictability. We have literally seen anything that’s thrown at us at this point, or so we think? Why is it, or could it be, so predictable of a storyline we have heard of before? Well, probably because it happens all the time in the real world that it seems like it’s just another one. I feel like I haven’t seen a film about a president’s campaign like this before, almost as if a camera was just there catching it all go down. I was hooked from the get go. It doesn’t hurt that it also stars Ryan Gosling, Phillip Seymour Hoffman, Paul Giamatti, Marisa Tomei, Jeffery Wright & Evan Rachel Wood. All of them are incredible and have proved so elsewhere, but they really all come together for a great ensemble cast! If you haven’t seen CONTAGION, DRIVE, MONEYBALL, or 50/50, that’s on you. Add IDES to the list and you have yourself some catching up to do! Speaking of CONTAGION, its editor Stephen Mirrione also edited IDES. He was on hand for a Q&A and it was amazing. This man has worked with so many great directors and the outcome has been SWINGERS, TRAFFIC, the OCEAN’S films, all of Clooney’s films, 21 GRAMS, BABEL, & BIUTIFUL. Yeah, just seeing that list, at least to me, you know you’re in good hands. He is amazing at what he does and how he works. The film moves so well, paced just right. It looks great, too. They tested it on film, Clooney insisted, and alas, long live film! The performances, as you would expect with all these Oscar winners and nominees, were superb! I believe Clooney knows how to handle actors and himself pretty damn well. There are quite a few scenes that stand out to me in this film; I’m still thinking about them and they were that powerful. I don’t want to give anything away, but let’s just say there’s that final standoff. Thank you, as always, to KCET, the Johnny Mercer Foundation, the American Cinematheque’s Aero Theatre & Staff, Stephen Mirrione, and of course, the man that brings us all these great films, Pete Hammond!